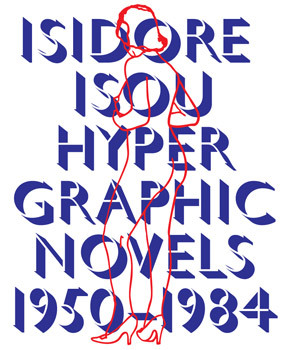 The Romanian Cultural Institute of Stockholm is proud to present an exhibition and an accompanying catalogue focusing on one unique but essential aspect of Isidore Isou’s work: his innovative and ultra-contemporary contribution to the novel, especially what he called the hypergraphic novel. This is the first time that an exhibition reunites all 734 plates from Isou’s three hypergraphic novels: Les Journaux des Dieux (1950, “The Gods’ Diaries”), Initiation à la haute volupté (1960, “Initiation to High Voluptuousness”), and Jonas (1974–1984, “Jonah”). Also on display, assembled together for the first time, are the 22 silk screens in Initiation à la haute volupté, as well as the 12 etchings in Jonas, alongside original drawings, rare documents, and press clippings of the time. The hypergraphic novel is a novel that is no longer restricted to using words and sentences, but integrates all the customary signs of communication, wrenched from their initial function in order to become the engines for overthrowing the art of prose and narration. It is a super-writing which integrates all the world’s alphabets (ancient, present, or invented), codes (morse, braille, musical notation, rebus), signs of communication, pictograms, prophetically anticipating the possibilities of computers and the Internet. This post-Joycean multi-narration, which from a distance could look to our modern eyes like trash comics half a century before their time, sometimes superimposes several layers of different colors, like screen filters in computer programs — call it the multi-colored novel — resulting in wild creations of an astonishing modernity. In connection with the exhibition, the Romanian Cultural Institute of Stockholm is publishing a unique bok on Isou’s hypergraphic novels, under the direction of Frédéric Acquaviva, with texts signed by Frédéric Acquaviva, Broutin, Maurice Lemaître, Cosana Nicolae Eram, Jonas (J) Magnusson, Roland Sabatier, as well as reproductions of selected plates and texts by Isidore Isou. The release of the publication will take place at the Romanian Cultural Institute of Stockholm on April 12. For information about the distribution of the book, please visit www.rkis.se.